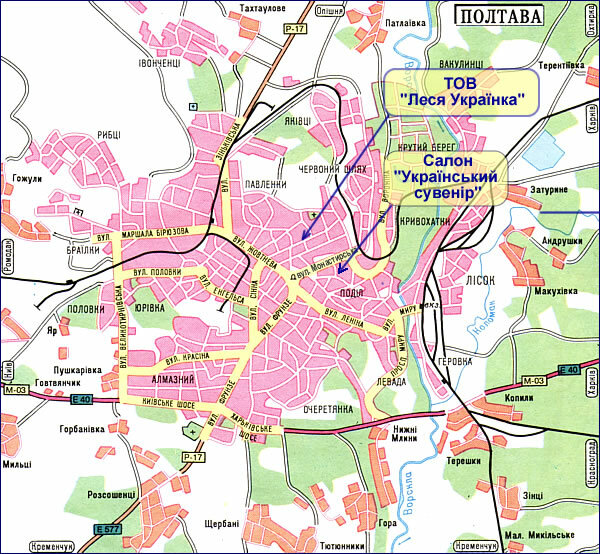 To look the detailed plan of location of JSC "Lesya Ukrainka" and salon "Ukrainian souvenir" in Poltava guide the cursor on a map. 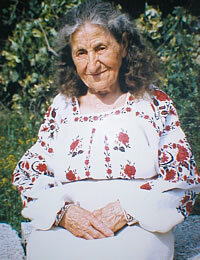 Embroidery is one of the most popular and widespread kinds of Ukrainian folk art. Colour rangers and rythms of ornaments, motives and plots demonstrate national spirit, glorious history, the wonderful nature of our land. Fairy images of flowers and birds tell about eternal dreams of Ukrainian people for peace and kindness and mercy.Embroideries of Poltava are a combination of geometrical and vegetative ornaments, gentle color scale of blue, ochre, greenish, grey and white tones. Ukrainian souvenirs are widely presented in salon "Ukrainian souvenir" in the city of Poltava. Poltava souvenirs occupy a significant part of an exposition. Poltava souvenirs are represented by oberigs and candlesticks, black smoky ceramics, coffee services, Opishnyanska decorative ceramics, potter's painted utensils - ugs, makitras, bowls, flowerpots, kumanci, kegs. The utensils is produced on a potter's wheel and undersigns by engobes, mainly vegetative ornament, by technics of horning and flandring. Warm colour is created by brown, red and ochre paints. The second group of products - modelled utensils of sculptural character with animalized subjects. The basic form is produced on a potter's wheel, plastically is processed and added to separate details. The third group of products - fine ceramic plastic - animalized toys in the image and likeness of traditional national samples. In assortment of Petrikivska paintings wooden turned and painted vases , plates, salad dishes, circles, sets for loose products, metal dishes , porcelain services, others are. You can order the Embroidery and the Poltava souvenirs by mail, having sent the application for the address specified on this page or through the Internet.